Genesis to Revelation in a single glance! 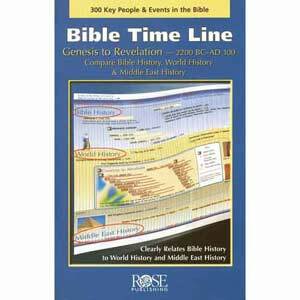 The bestselling Bible Time Line pamphlet shows hundreds of events in biblical history side-by-side with world history and Middle East history. Teachers love how easily they can compare biblical events to those that occurred elsewhere around the world. For example, the pamphlet shows that Daniel, Buddha, and Confucius lived at the same time. Information includes 200 key people, dates, battles, and key events in Israel's history. The pamphlet is glossy, full color and is filled with illustrations and photographs. Moses was leading the Exodus while the Sheng Dynasty was flourishing in China. Mt. Vesuvius erupted and buried the city of Pompeii just 50 years after Jesus' death and resurrection. The apostle John probably would have known about it. At the time of Jesus, Rome dominated most of southern Europe and northern Africa. Other powerful civilizations included the Kingdom of Kush in Africa and the Han Dynasty in China. Emperor Caligula who ruled 7 years after Jesus' resurrection was a madman. He made his horse a senator. Trajan, the general who destroyed Jerusalem in AD 70, later became Emperor of Rome. He officially made Christianity a crime punishable by death. When Paul was taken under guard to Rome, he didn’t see the Colosseum. It was built 4 years after his death. Emperor Nero, who had Peter and Paul executed, also had his wife and mother killed. The Bible Time Line pamphlet, in which Bible times, world history, and Middle East history are compared side-by-side, create one of the most comprehensive and valuable tools available to students of the Bible, as well as students of history. Biblical eras such as Abraham to the Sojourn in Egypt, Moses and the Exodus, the Judges, United Kingdom, Divided Kingdom, the Exile, Restoration of Jerusalem, Intertestamental Period, and ultimately, the New Testament.